Swashbuckling stories about pirates always talk about some salty rag-topped bandit diving off of a creaky wooden crow’s nest and swinging on a rope down to the ship’s deck, sword in hand, fighting to raise the Jolly Roger. The best of what a pirate’s booty could buy his sweetheart would have to be Black Pearls ~ deep dark chocolate and cream cheese truffles studded with tart cherries and chewy coconut. My sister deserves the credit for these little beauties. The first time I had them was a lazy Sunday when she came over for breakfast. I made her crepes. She made me truffles. Guess who got the better deal? My sister is a purist and keeps the truffles elegantly simple as a creamy, chocolaty treat. The cream cheese really makes these sweeties sinfully luscious. I, on the other hand, wanted to push the envelope a bit. The addition of coconut and cherry turned out to be brilliant, because they both fare so well with chocolate. The coconut adds a nice chewy texture and rum-soaked cherries punch some sweet-tart flavour here and there. Black Pearls are a pirate’s dream come true. And, if you’re as lucky as I am, you can enlist the cutest little lass in all the Seven Seas to serve them. Note: The secret to delicious truffles is the chocolate. Be sure to use good quality as it is the focal point of flavour. Trader Joe’s Belgium Pound Plus is excellent and melts beautifully. Omit the rum, if you expect children to eat these. For the finished look, a simple dusting with confectioner’s sugar is nice, but colourful sprinkles are more festive. Soak dried cherries in rum, if using, for at least 1 hour. Dry with paper towels to remove excess moisture. Chop the cherries into smaller chunks and transfer to a clean bowl. Melt chocolate gently in a double boiler or microwave. Blend with the cream cheese with the cherries, coconut and vanilla. Cover bowl with plastic wrap and chill in fridge for about an hour, until firm. Transfer some sprinkles into a small bowl. into a ball. The heat from your hands will start to melt the outer shell of the truffle. This will make it easier for the sprinkles to attach. coat evenly. Gently place truffle onto a baking sheet and return to fridge for another 30 minutes. Valentine’s is a special holiday when you take the time to make something by hand for that important someone in your life. Truffles only look complicated. They are just so easy that anyone can make them. Black Pearl truffles carry a hint of romance and adventure. They are sure to get raving reviews from even the harshest critics, because nobody can resist candy sprinkles, which are not historically relevant, but always sure to get a warm welcome. 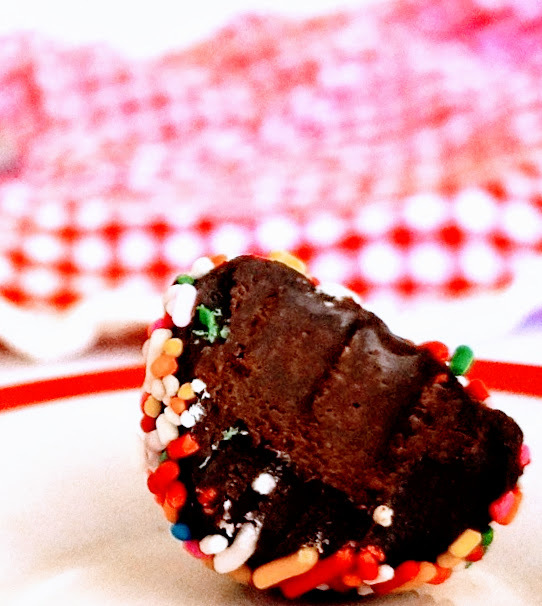 But, be warned: Make these for someone very special, because whoever tastes them is sure to follow you everywhere you go, like a lovestruck puppy. Forever. And, if you’re single, you must still celebrate the day. Some monumental pampering is in order. Schedule a massage, followed by a mani/pedi. Next, some serious shoe-shopping in search of that perfect pair of sandals to show off your pretty little toes. Then, jet home for a relaxing bubble bath. Finish the evening watching Gigi, sipping some bubbly, nibbling on Black Pearls. Who better than you deserves such a treat? Love these truffles, they are so perfect! I don't know who is more adorable, the little pirate sweetie or the chocolate sweetie – SO delicious and so special for Valentine's Day! These sound and look delicious! And they're so cute. Though, not as cute as your little one! xo Happy Valentine's Day! These look creamy and delicious. I love truffles. Super cute and yummy. Love the pirate photos.